Exploring design direction for the new tiger cartel website. Back to the roots of my first dribbble shot. Finally I could put some time in to work on the animations as well. 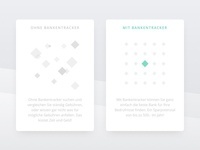 Check out the playful dot animation.